After several comments from users about confusion with recent enhancements to the Tour de France live tracking capabilities, I contacted the author about the problems. 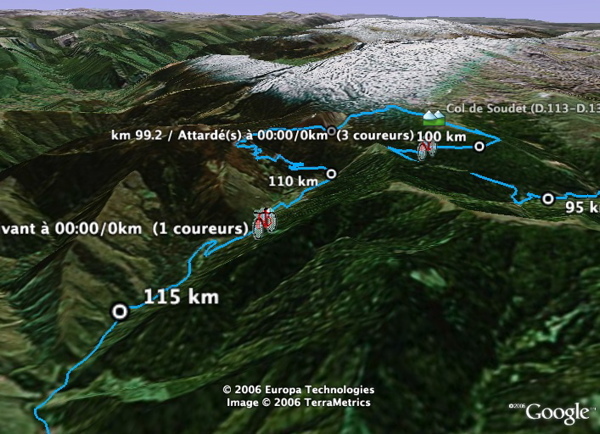 He has now revamped the live tracking interface for Tour de France 2006 by having a folder which contains network links for several of the bikes in the race, and another folder which contains a list of camera network links you can turn on which give you tilted views, general views, and close up views of the racers' positions. If you are using GE 4 the list of camera views are radio buttons so you just toggle between each view. In addition, he added a feature which tells you when the next stage begins when the racers are finished with a stage. Read more about this tool in the original GEB story.